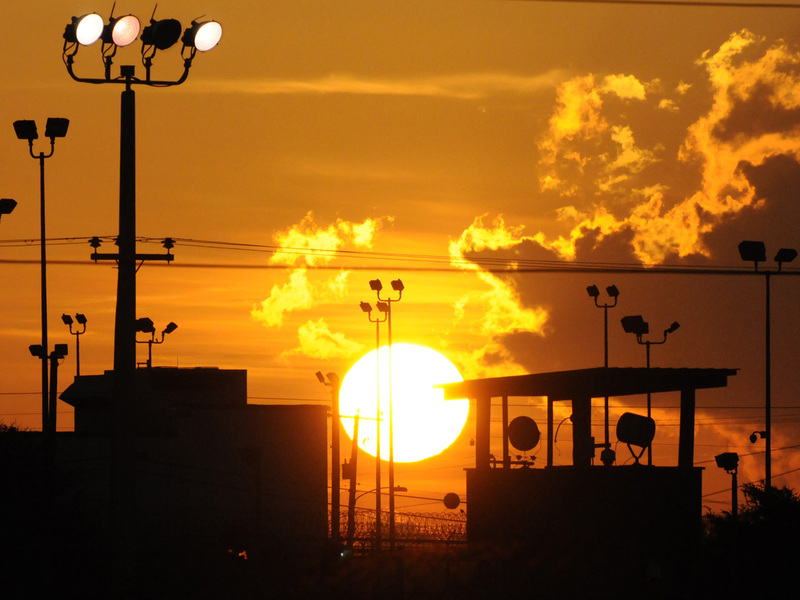 MIAMI Prisoners taking part in an expanding hunger strike at Guantanamo Bay leveled new complaints about their military jailers Wednesday as a team from the International Committee of the Red Cross made a fact-finding trip to the U.S. base in Cuba. In an emergency motion filed with a federal court in Washington, lawyers say guards have refused to provide drinking water to hunger strikers and kept camp temperature "extremely frigid," to thwart the protest. A spokesman for the detention center denied the allegations. "The reality is that these men are slowly withering away and we as a country need to take immediate action," said Mari Newman, a human rights lawyer based in Denver, who was among those who submitted the motion. They filed the petition after interviewing Yemeni prisoner Musaab al-Madhwani by phone Monday. He told them that guards were refusing to provide bottled water and telling prisoners to drink from tap water that inmates believe is non-potable. The lawyers say in their motion that the lack of drinkable water has "already caused some prisoners kidney, urinary and stomach problems," in addition to the health effects of the hunger strike. Attorney: Guantanamo detainee "skin and bones"
General calls Guantanamo hunger strikers "frustrated"
Along with their motion, they submitted an affidavit from Dr. Stephen Xenakis, a psychiatrist and retired general, who believes that the hunger strike and lack of adequate drinking water "sets them up for gastrointestinal infections and a quick demise." The doctor also said the 34-year-old al-Madhwani suffers from post-traumatic stress disorder linked to his torture while in U.S. custody in Afghanistan and could be worsened by harsh conditions at Guantanamo. The U.S. government has not filed a response to the motion. Navy Capt. Robert Durand, a spokesman for the prison, said prisoners are provided with bottled water and that the tap water is safe to drink. "It's potable water. It's the same water I make my coffee with and that they make lunch with," Durand said. He also denied that there had been any change to the air conditioning settings inside the prison camps. Accounts of the hunger strike have been in sharp conflict for weeks. Lawyers who have visited or interviewed their clients say a majority of the 166 men held at Guantanamo have joined the protest and some have lost significant weight and are at serious risk. The military said that as of Wednesday, there were 31 men on hunger strike, up from 28 on Monday. Three men were at the hospital being treated for dehydration and 11 were being force-fed with a liquid nutrient mix to prevent dangerous weight loss. A two-person delegation from the International Committee of the Red Cross that includes a doctor is at the base to assess the situation. They started a week earlier than planned because of the hunger strike, said spokesman Simon Schorno. Their findings will be presented to the camp commander and Miami-based Southern Command, which oversees the prison, but will not be made public. Lawyers for the prisoners say the hunger strike began on Feb. 6 as a protest of the men's indefinite confinement without charge and because of what they said was a return to harsh treatment from past years, including more intrusive searches and confiscation of personal items such as mail from their families. The military says no policies or procedures have changed at Guantanamo and the strike is an attempt to draw attention to their cause. White House spokesman Josh Earnest says President Obama's team is closely monitoring the hunger strikes, but deferred to the Pentagon for any specifics. "The administration remains committed to closing the detention facility at Guantanamo bay," Earnest said, noting that legislation passed by Congress makes it likely that process won't be quick.